We are not providing forecasts on the long-term future of the global energy landscape and the size and dynamics of the Oil & Gas markets by 2040. Some of the trends seem clear, but the question is how fast will the evolutions be. Many players try to model this long term, some describing their expectations on a greener planet, others providing a more conservative view. One main and recurrent element in the forecast exercise is the threat of global warming and the need to curb CO2 emissions – and only few still challenge the reality of this global warming. Then, one can assume, or wish, that this challenge is properly addressed, or fear that it is only partly addressed… one can expect bold and breakthrough political decisions, or one can expect the civilian society to take actions… one can dramatize the scenarios to push its political opinions. From the Oil major scenarios to the IEA ones to the OPEC ones to the Bloomberg New Energy Finance scenario to the Greenpeace one, the energy landscape identified for 2040 varies significantly. We can see a major shift towards Renewables and Electric Vehicles, which is highly celebrated in the news. For example, global new clean energy investment and capacity installations have been in the $300b range in the last few years, with yearly capacity additions in excess of 160GW ; solar and wind should attract 60% of new investment in power generating capacity in the coming future. At the same time, Electric Vehicles sales are almost doubling every year, close to 1 million units sold in 2017. The point we would like to make in this blog is that these evolutions may look game changing -and they are from the point of view of these markets – but without any breakthrough, their impact will likely be very slow and gradual. This implies the energy transition targets may be difficult to reach, and the Oil, Gas & Petrochemical industries may continue to develop for a while. Today, about 10% of the global Oil production is being used for Air or Marine transportation. Both sectors benefit from healthy growth rates, linked with globalization of tourism and trade. Both sectors rely almost exclusively on kerosene, aviation fuel and marine bunker fuel. The ongoing and likely further evolutions are into aviation biofuels, cleaner marine bunker fuel, and use of LNG as marine bunker fuel. These evolutions are no threat to the OGP industry. There are some prototypes and research on electric or hydrogen-powered aircrafts or ships, but their impact on the industry should remain nil for many years. Then, Ground Transportation (cars & trucks mainly) use about 45% of the global oil production, not to mention 1 or 2% of the global gas production (think of the 5+million LPG, LNG or CNG cars, busses, & trucks on the roads). The current stock of light duty vehicles is about 1 billion… with close to 100 million new vehicles being sold per year. Electric Vehicles therefore represent only 1% of new vehicles sales and an even smaller fraction of the total vehicle stock. 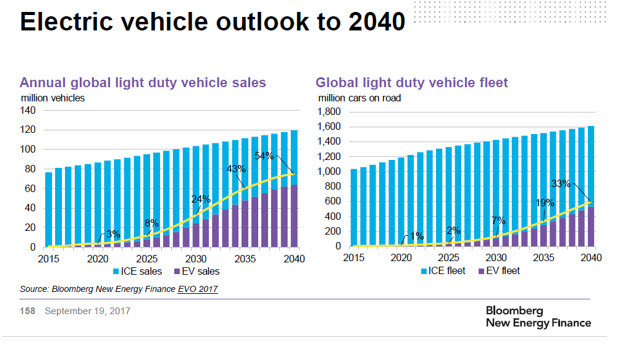 The diagrams below, from BNEF, show their forecasts of Electric Vehicles sales and share of the global vehicles stock. They indicate that until at least 2030, the number of Internal combustion engines on the roads will continue to grow, due to the market development in non-OECD countries. Then, Power Generation… this sector uses today close to 40% of the global gas use but only about 5% of the global oil production. Power Generation is clearly shifting towards renewables… again, with a very small & gradual impact on the global & total power generation landscape. The role of Gas power generation as a relatively clean ‘transition energy’ and backup for renewable intermittencies differs from one scenario to the other. We also need to remember that the situation will vary widely by country. Most of the growth in Power Generation is taking place in non-OECD countries. The government decisions in China, India and others will likely have a higher impact than the energy policy of European countries. They will have to arbitrate between the need to ‘clean up’ the air in their cities from particles, complying with the Paris climate agreement, limiting their spending on foreign technology or hydrocarbon imports, leveraging ‘cheap’ local coal… We see Egypt exploring renewables power generation but also aggressively developing their natural gas production capacity with the Zohr mega project…. We see Argentina developing their shale gas resources… and at the same time, Gulf monarchies want to develop their solar power generation… in order to sell a higher share of their hydrocarbon production instead of using one third of it locally, as they currently do. Industrial and Building uses represent about 24% of global oil uses and 56% of global gas uses. We for sure see a steady trend towards electrification of a number of processes, including electric heat pumps replacing or complementing fuel or gas burners. But these evolutions depend on the renewal time for these processes and burners, which is usually in the 20 to 40+ years range… So any evolution will take 10+ years to have significant effects. Last but not least, the petrochemical industries benefit from a resilient growth, driven by non-OECD gdp growth; most analysts expect this growth to be sustained over the next 5 to 10 years. Petrochemicals represent about 13% of current oil use (and now a few % of gas use, as the US Shale gas is very rich in ethane, propane and butane, used as petrochemicals feedstock). The recycling value chains are developing, but recycling impact will regretfully remain limited in the short term. To conclude, the energy landscape evolution is obviously underway. This means we may be missing the energy transition targets, as the Oil & Gas & Petrochemicals markets will continue to develop in the “immediate future” (5 to 10 years at least). At the same time, an increasing number of Oil majors recognize the urgency to act and become active players in this energy transition.